Jacob Foreman was 22 years old. He probably didn’t know that his older brother William had died of typhoid fever on February 27th at Paducah, Kentucky. Ulysses S. Grant was approaching his 40th birthday. By swiftly moving and coordinating his attack with a naval bombardment, Fort Henry fell on February 6th 1862 and ten days later Fort Donelson fell with some 14,000 prisoners. In less than two weeks Grant had opened up the road to Nashville and has set the stage for the advance on Vicksburg. 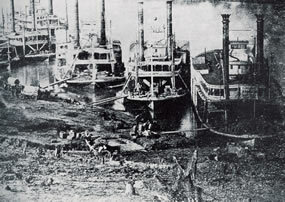 The 28th Illinois Regiment was among the 17,000 troops that left Paris Landing and moved by steamers to Pittsburgh Landing, Tennessee stopping each day to gather rails and wood for boats. The 28th was among the first to land, and went into camp near the double log house on the hill, west of the landing, but only for 2 hours; was then ordered out 2 1/2 miles northwest of the landing under command of Major Gilliam, for 3 days picket duty. When relieved, returned to landing, when the Regiment was again moved a mile and a half south of the landing, where it cut out a new camp. This entry was posted in Family History and tagged 28th Illinois Infantry Regiment, civil war, genealogy, history, Illinois, Pike County, Pittsburgh Landing, Shiloh, Tennessee, U.S. Grant.